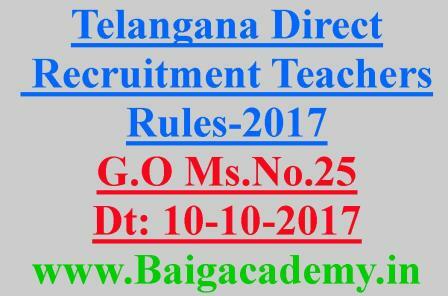 Today (10-10-2017) Telangana State Government Released G.O.Ms.No.25 Dt:10-10-2017 for Telangana Direct Recruitment for the posts of Teacher's Rules 2017 and issued orders. Selection Procedure Of Recruitment and Qualifications post wise in detail. 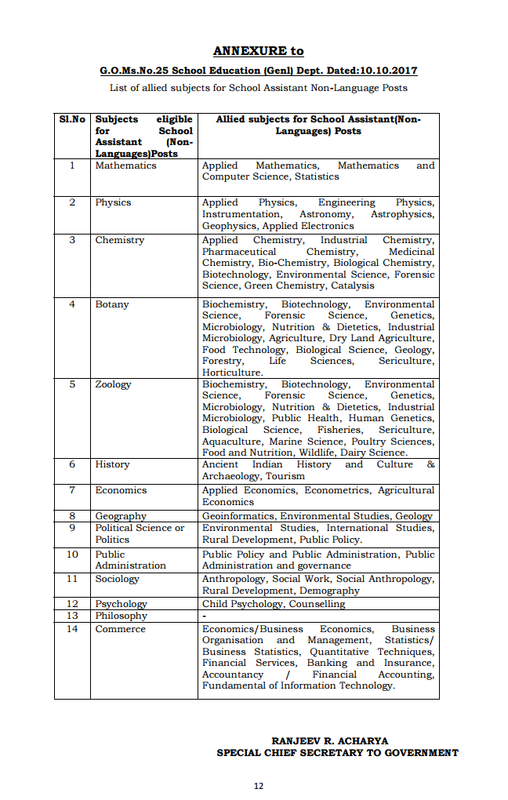 The TSPSC shall issue Notification for direct recruitment for the posts of Teachers in accordance with the orders issued by the Government duly notifying the vacancies as per the requisition furnished by the Commissioner & Director ofSchool Education for the 31 Revenue districts as formed/reorganised by the State of Telangana w.e.f.11.10.2016, taking each such district as the unit of appointment as per the relevant Rules. Local Scheduled Tribe candidates shall only be considered for selection andappointment against the vacancies in Scheduled Areas as per G.O.Ms.No.3, Social Welfare (TW.Edn.II) Department, dt.10.01.2000. They shall also be considered forselection to the posts notified in Plain area if they come up for selection. 1. The rule of reservation to local candidates is applicable and the provisions of Telangana Public Employment (Organisation of Local Cadres and Regulation of Direct Recruitment) Order (Presidential Order) 1975 and amendments there to shallbe followed strictly. 2. The rule of special representation in the matter of appointment of candidates belonging to Scheduled Castes, Scheduled Tribes, Backward Classes, PhysicallyChallenged, Ex-service Men and Women is applicable as per the Telangana Stateand Subordinate Service Rules, 1996 as amended from time to time. 3. No Physically Challenged quota should be extended for the School Assistant(Physical Education) and Physical Education Teacher Posts as the said quota is not considered for admission into the Physical Education Training courses. 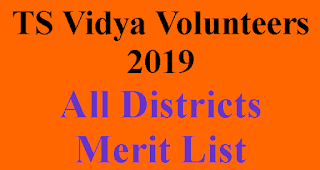 The posts earmarked for School Assistant (Physical Education) and Physical Education Teacher should be filled with eligible meritorious candidates as per the Government Memo.No.1351/Ser.VI/2008-2, dated. 01.04.2008.
selected candidates as per the choice exercised by the selected candidates in the counselling for the schools under the control of the Appointing Authority. Detailed guidelines regarding the counselling procedures etc., will be issued separately. Actually in previous DSC They Given 20% for Non Local. It Doesn't means Seperate 20% for non local. 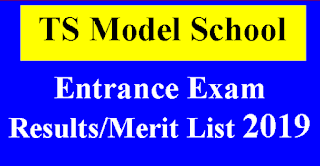 For Example: 100 seat are there so you have to get a rank in top 20 candidates.then only you will be consider. but time to time rules may be change. so wait for detail guidlines.